Yesterday I had a frustrating, yet ultimately enlightening and positive experience with my car. I’ve written two blog posts about my Prius before: the first about my experience buying a used Prius (and how happy I was to pay for it with cash), and the second about how much I was loving the car after having it for about seven months. The car also got an honorable mention in another post because I had to call the complimentary road side assistance for a jump-start the day after writing about that seven month experience. That jump-start was actually my first indication that there was a problem to address, but I didn’t realize it at the time. A month later, I was running about town with a friend and had the battery die again. I needed yet another jump-start, and that second time the road side assistance response wasn’t as great. We had to call another friend to stop by to jump-start the car because one gets very cold sitting a car in December when the heater can’t run. Another month goes by, and I am once again unable to start the car. This time, when I called the complimentary road side assistance they were prompt in responding (thank goodness!) and I requested a tow. There was obviously something really wrong that needs fixing, so getting it towed to a Toyota dealer seemed to be the best thing to do. We ended up having to jump-start the car first just to get it out of the garage, but then the car was hoisted onto the truck and away we went to the Toyota dealership that is three miles from my house, Grossinger Toyota North. I had taken the car to Grossinger for service once before. Back when I purchased the car in March 2012, I also purchased a pre-paid service plan for it. I got a reminder in the mail that the car was due for service, so I made an appointment at this dealer because it was close to my house. Yet when I checked the car in, I was told by the service assistant that since I had not yet driven the recommended 5,000 mile interval between oil changes, the service would be denied by the plan. I could pay for oil change myself, but I declined to do so and left. The outcome of that service experience was that I needed a new battery. (Not the hybrid battery, just the regular old 12-volt battery that stores charge for the car to start and powers accessories.) Grossinger had the car for about three days because I asked that the service department try to get the battery replacement covered by the Toyota Certified warranty or the service plan. After all, I had owned the car less than a year and Toyota Certified cars are warranted for a full year. Unfortunately, neither the warranty or the maintenance plan covers items that fall under normal wear and tear, and that includes batteries. While the car was there, the service department recommended that I have a recall service taken care of, no charge. That made sense to me, so I authorized it. Oh, but I when I asked about an oil change I was told to wait until I had reached the 5,000 mile interval. (Yes, I had owned the car for 10 months and still had not driven 5,000 miles. I don’t drive a lot.) After three days, I paid my $300 for a new battery (gulp!) and drove the car home. That was back in January, and while I was pretty upset at myself for buying this useless service plan I didn’t think much more about the experience. Yesterday, I had a lovely day of leisure planned. I had taken the day off work and was driving up to the Midwest Fiber & Folk Art Fair for a knitting class and an afternoon hanging out with friends. But as I was driving the Prius on the expressway, a warning light appeared on the dash: a big, red triangle with a large, red exclamation point inside. I pulled over to the shoulder, put the car in park and got the owner’s manual out of the glove box. I turned the car off while I found the section about warning lights, then turned it back on to see if the light popped on again. (Yes, I kind of thought that “re-booting” the car may make a difference!) The scary triangle appeared, and I could also see another symbol on the Multi-Function Display (the little screen where many of the controls are activated) that I looked up in the manual: hybrid system warning. The owner’s manual advised to get the car to a dealership for service right away (duh! ), and so I thought about this for a few minutes. The car didn’t seem to be driving and handling poorly, so did I really need to call a towing service, or could I drive it to the nearest Toyota dealer? I knew that if I kept driving for another 10 or 15 miles, I could bring the car to AutoNation Toyota in Libertyville where I had originally purchased it. I would also be fairly close to where I was taking my knitting class, and perhaps one of the friends I was meeting there could pick me up at the dealer. I took a chance and pulled back onto the expressway. The car was driving fine, except for these scary warning lights. I made one more brief stop at an oasis on the toll road so I could consult some maps to make sure I knew the exact route to AutoNation, and to call my friend about getting a ride. As I drove out of the oasis, the car was still driving just fine, and I happily made it to the dealership service bay. I was stressed out when I walk into the service department, yet the service person was kind and calming. He checked in my car and looked it up in the computer system to view the service records and start a new service ticket. Meanwhile, I complained to him that I am not happy with Toyota and this stupid service plan right now. I told him how I had been denied an oil change at Grossinger because I hadn’t driven the recommended 5,000 mile interval (and for the record, I still haven’t! ), how I had to replace the battery less than a year after purchasing this “certified” and “warranted” vehicle, and how I was on my way to a class and hoping not to miss it. Carlos (I’m not going to give his last name here in respect for his privacy) apologized for the misinformation I had been given and told me that I should be able to get an oil change every six months OR 5,000 miles. He said they could take care of that service while they ran the diagnostics on my car, as long as I could leave it for several hours. He informed me that the diagnostics check was $99, though, and I’d be expected to pay it since it is not standard service. I wasn’t happy to pay anything, of course, but anxious about what the heck could be going on. He gave me his card with a direct number and told me that he would call me in the afternoon, although the earliest the car would be ready was about 1 PM. I sat in the service waiting area for a bit as I waited for my friend to arrive and take me to my class. I connected to the free wi-fi, I drank some coffee, and I tried to call B, who would be on the road himself, for a memorial service with his family. I posted about my bad morning on Facebook, and quickly received a reply from a (currently car-free) friend that this Toyota dealership in Libertyville was the best in the area, and that she had regularly taken her Toyota there for service despite living more than 30 miles away from it. My friend Adrienne came to my rescue and I only ended up missing about an hour of my three-hour class. I enjoyed a pleasant lunch with her and some friends that were visiting from out-of-town, and we prepared to re-enter the Fair for browsing and shopping. Before I did that, though, I pulled out Carlos’ card and gave him a call. It was about 2 PM, and I wanted to find out if they had figured out what is wrong with the car. Indeed, they had. The good part was that the problem was easily fixed and the car would be ready soon. However, Carlos also had one more update to give me. While driving the car for the diagnostics, they had found that the left front strut should be replaced. This should be warranty service and wouldn’t cost me anything, yet he needed to contact the warranty office and they would need to order the part. While I wasn’t entirely happy to hear they had found another potential issue with the car, at least it sounded like it wouldn’t result in more cost to me. I was glad that the warning lights were easily addressed and that my car had finally — after 16 months!! — gotten an oil change, too. Carlos suggested that I go back to Grossinger and ask them to refund me the diagnostic fee. Oh, boy would I ever do that! The rest of my afternoon went smoothly. I browsed the Fair. I bought some yarn and some healthy chews for Hannah dog; I hung out with Adrienne and her friends, and hitched a ride with them to the hotel where they were staying so we could hang out a bit longer and have dinner. (And also so I didn’t have to sit in Friday afternoon rush hour traffic on a rainy Friday.) It was about 8 PM by the time Adrienne dropped me at the dealership again to pick up my car. Carlos was long gone by then, but another service assistant was there to help. He seemed to be having issues locating my paperwork, though, and I started feeling anxious again. Adrienne was already gone and I really needed to get home to take care of Hannah dog. The service assistant suggested I sit down in the waiting area while he called Carlos. A few minutes later, he entered the waiting area with a phone and said that Carlos wanted to speak to me. Uh, oh. He apologized for my paperwork not being closed out; he had been waiting for the warranty service to get back to him and they hadn’t done so. He then said “I’m not going to charge you anything for today’s service.” Wow. I got my car back in great shape, with clean oil and no scary warning lights. I still have this strut issue to deal with, but I will gladly take my car back to AutoNation to get it addressed. I told Carlos about the comment my friend had made about their service department being the best in the area and he said that he heard that frequently; he had once helped a guy who regularly came in from Rockford, IL (that’s 80 miles away!) for his car’s service. As much as I loved the service at AutoNation, I do hope that I only have to go back a couple of times a year for my regular oil changes and maintenance since it is 28 miles from my house, and at least at 35 minute drive each way. As I left last night, I told the service assistant I felt like I owed them all a big hug. Instead, I’ll do the more acceptable approach and write a glowing letter of praise to the service manager and dealership management. And I’ll also bring a big box of doughnuts when I go back to get my strut fixed. Grossinger, on the other hand, will never get ANY patronage from me again, and will get a different kind of letter to their management. Warning: there will be photos and video of bees on this post, so if bees creep you out, don’t proceed any further! The bees were installed in late April, and I took video of the process. Follow the link* to watch how Paul literally shakes the bees into the hive! I was standing about five feet from the hive while this was happening, wearing nothing more than a light jacket and jeans. There’s a brief point where I blow a bee off my finger, making the shot go a little haywire, but otherwise I had no other bees make contact with me. The hive had been put in place just the day before. There are two boxes of frames, a few of which had some comb already built out on them. The bees use comb for nurturing brood (bee eggs or pupae), storing pollen, and storing honey. About a month later, here’s those busy bees at work. Notice how calm the bees are. Whenever Paul has to work with the bees he uses a bee smoker to shoot a few puffs of smoke at the hive as he works. He’ll start the smoker, puff around the hive a bit, take the lid off, puff some more smoke into the hive, and add a bit more smoke here and there as he works his way through the boxes of frames. Meanwhile, I’m usually right there with my camera taking photos and helping him work. I don’t feel the need for any protective gear, and have even helped him with the hive while wearing cropped pants and flip flops. Paul owns a beekeepers veil, but he’s never worn it while working on the hive, either. The bees are incredibly gentle. We had to pick up the entire hive at one point so we could position it inside a “moat” to keep ants from entering inside. My face was only about a foot from the entrance to the hive as we lifted it up and moved it around, yet I never felt in any danger. We’ve already had a setback or two. A new hive is vulnerable to all sorts of opportunistic critters. Wasps may try to enter the hive to prey on the bees, and ants can enter the hive to steal food. 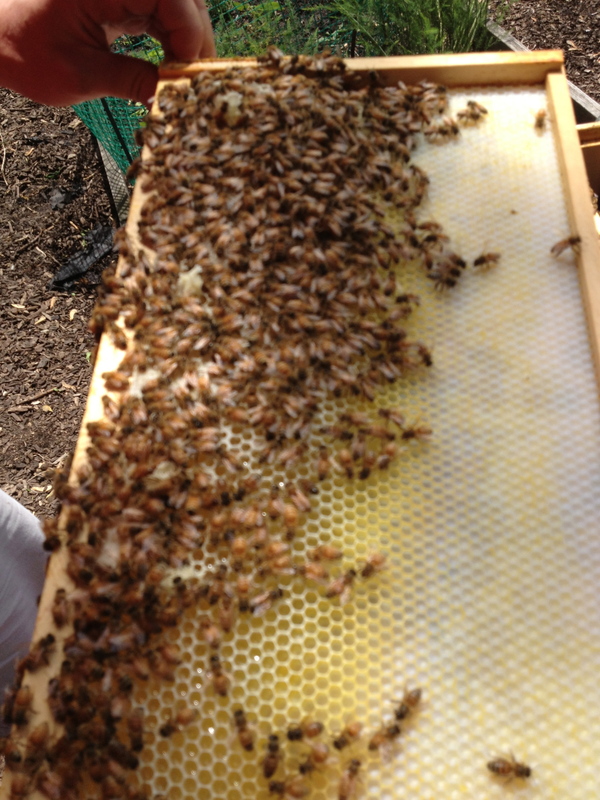 While the hive was getting established they were fed with a sugar and water mixture. The ants were really attracted to it, which is why we set the hive inside a kiddie pool “moat” which would have required the ants to cross open water to get to the hive. It worked. The other issue we ran into was that the queen disappeared. Paul thinks that it was because he didn’t have enough frames with comb on them available for her to lay brood. 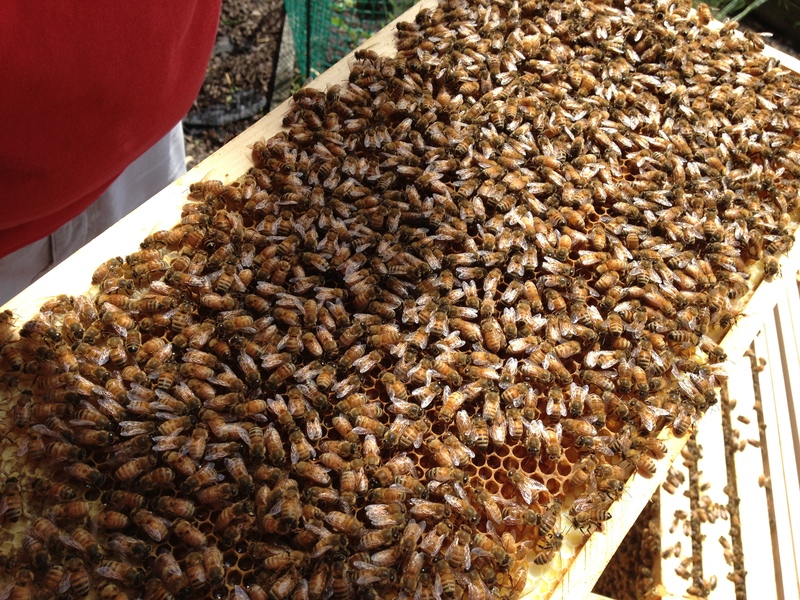 He could tell that the queen was missing because he was seeing less and less brood on the frames. So a new queen was ordered and shipped via UPS all the way from California. Here she is in her excluder, a special little cage she had to stay in for a day to make sure the hive acclimated to her. 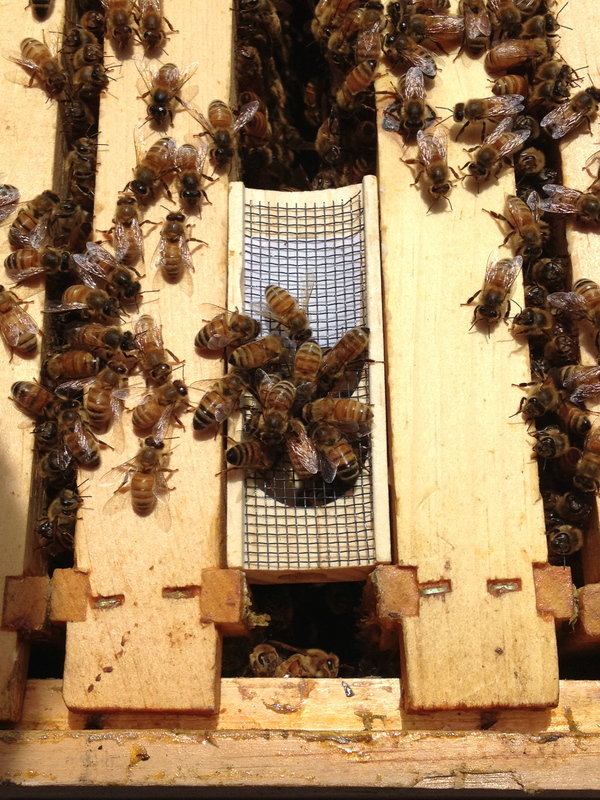 The cage is fitted between frames in the center of the hive. Apparently it’s a good sign that the worker bees crawling on the cage are facing her and trying to feed her. If they were aggressive towards her, they would have been facing the other way and trying to sting her. When the hive is open, I love watching the bees at work. I’ve watched them doing their little bee dance, and I’ve seen them raising their rumps in the air, fanning their wings to spread messages with pheromones. Watching the bees as they zip to and from their hive is also a treat. Probably one of the most fascinating things I’ve seen when observing the hive was the work of undertaker bees. Paul had told me about them, but I didn’t think I’d see them at work. Undertaker bees are in charge of cleaning up dead and dying bees from the hive. A few days ago I was in the garden and stopped to watch the bees. That’s when I noticed this entourage leave the hive flying in a poorly coordinated fashion. There were two worker bees carrying a third bee between them. They only made it about six feet from the hive before they fell to the ground. The worker bees seemed to be trying to get going again, but they were only rolling around on the ground and eventually first one, then the other worker bee took off and flew back to the hive. I noticed that the bee they had dropped was still moving its legs, so I picked up a stick and turned it around so I could observe it better. It’s wings looked in poor shape and it’s abdomen looked oddly deflated and not plump. Apparently worker bees only live for a little over a month. They work so hard that they may actually wear out their wings. That dying bee may have been a worker or it may have been a drone that had recently mated with the queen, which would have accounted for the abdomen looking so odd. Apparently when drones mate with the queen, their endophalluses are ripped off and their abdomens are ruptured. Yikes! What a way to go! *Apparently I can’t embed the video without purchasing more storage from WordPress. 😦 It’s a short but interesting little video, so I encourage you to follow the link to my Flickr account and watch it. Today is my birthday. I’m now officially 46 years old and closer to 50 than I am to 40. It’s OK. Getting older has some benefits. To me it seems that aging involves better self-knowledge and general life experience, but less physical resilience. I haven’t fallen into total decrepitude, although I did spend most of one day in the ER last month only to learn that I can now add diverticulitis to my list of infirmities. I’m stumped as to why I developed a condition and infection that typically develops from eating too much processed food and low fiber. If you ask any of my family and friends, they’d say I eat a heck of a lot of veggies and high fiber foods, and eschew most highly processed stuff. It may be that the dietary changes I’ve been forced to make with the braces have had an impact and/or it may be stress related. Stress is something I really need to get a handle on. For the past several years I’ve become increasingly unhappy in my job, and I’ve tried to find something to do in my company that will continue to interest and stimulate me. I’ve been working with this organization for nearly 15 years and there is a lot that I like about it. But if every day is a drag and leads me to spikes of frustration and tears, then it’s time to do make some changes. I’ve been transitioning to a new role for the past five months, yet my tolerance levels haven’t improved. I still get pinged about stuff related to my old role and haven’t completely off-loaded certain tasks. When that stuff happens, I can feel really explosive. There are frequently days where I feel like just running away and living in a little camper truck so I can pick up and move whenever something starts to annoy me. We’ve been having the most marvelous spring weather, though, and it makes me love my garden and yard intensely, and reluctant to give it up. We had a lot of rain in May, and even some flooding in the area. (My house remained dry and snug.) There have been a few light showers in June, but nothing terrible. The coolness of the weather has been a real delight. Some people love hot weather, but I’m more fond of the moderate temperatures we’ve been having. I’ve added two new things to my life this year that are working out well so far: bees and horses. The bees are living in the garden in a hive owned and cared for by my dog walker. He started exploring bee-keeping last fall, and approached me a few months ago about putting a hive in my yard. I love bees and have often thought about adding a hive to my yard, but the learning curve was intimidating to me. I now have the best of both worlds: a hive AND no responsibility to care for it. I’m fascinated by the bees, though, and whenever Paul has to tend them I’m usually right there with him watching and learning. They are super gentle. We’ve had to open the hive a few times, and even pick it up to place it on a better footing, yet the bees have never acted aggressively or stung us once. While Paul does have a bee veil and suit, he’s never needed to wear the veil while working with the bees, and I’ve been out there helping him wearing shorts and flip-flops. I haven’t added a horse to my little city homestead, but I have been happily (ecstatically!) taking riding lessons at a stable not far from my home. Like many girls, I was horse crazy in my younger years. We didn’t have the resources for me to take riding lessons regularly, but I did spend two weeks at Girl Scout “horse camp” one year, and learned how much I preferred English tack over the Western gear I had been exposed to during occasional trail rides. Back in 2008/2009 when I was going through the divorce, I identified regular horseback riding as something I wanted to take up during one of my introspective times. I made some attempt at that time to take riding lessons at a local stable (not the same one I’m riding at now) and was really disappointed. This time the opportunity presented itself because one of my friends suggested we take a vacation to Scotland in the fall. In looking over the details of the trip, I saw that a couple of the places we’ll be staying have riding stables nearby. So I got the idea to train for taking one or two (or maybe even three) half-day riding excursions while in Scotland. While it may be possible to ride Western saddle there, I really want to ride English and am training with this in mind. The stable I’m going to now is so much better than the other one I tried. I like all the people I’ve met (trainers, receptionists, grooms, and other riders), and all the school horses I’ve ridden have been well-behaved. I’ve been on five different horses and am working with two different trainers so I’m getting a lot of varied experience, which is exactly what I want and need. I started lessons in March and am now riding twice a week. Even though I was in pretty decent shape before I started lessons, it’s taken a while for my body to adjust to the demands of riding. I have to develop muscle memory, balance, and confidence to be a good rider. I’m not the fastest kinesthetic learner, and while I could build strength in the muscles used in riding at the gym (core and legs), there isn’t a way to emulate exactly how those muscles are used in riding except to…well…ride.